Wind blades and towers are often subjected to corrosive and erosive environments owing to their placement amid harsh conditions on land and at sea. This can severely affect the overall efficiency of wind power equipment and result in reduced efficiency of the overall setup. These elements can also lead to a massive deterioration of the strength, reliability, lifespan, and economic value of wind power structures. To avert this, a number of coating are applied on structure and components to protect them from the harsh environment. The global market for wind coatings has witnessed massive expansion in the past few years in terms of the variety of products available, the technologies put to use, production capacities of leading vendors, and the set of applications that the market serves. The demand for coatings for wind turbines is expected to rise at a promising pace in the next few years owing to a promising rise in adoption of wind and photovoltaic (PV) systems, growth in focus on decreasing the maintenance costs, and improvement in efficiency. This is expected to drive the wind power coating market. The wind power coatings market is expected to grow during the forecast period due to increasing demand for energy from across the globe. The key factors driving the wind power coatings market across the globe are decreasing levelized cost of electricity (LCOE) of onshore and offshore wind power and increasing greenhouse gas emissions, which is prompting countries to increase their renewable energy output to produce clean energy. This, in turn, is anticipated to boost the wind power coatings market. In terms of type, the wind power coatings can be classified into polymer coatings, metal coatings, and ceramic coatings. The most common polymers used for coatings include epoxy resins, polyurethane, acrylic resins and many more. Polymer coatings have excellent corrosion resistance, toughness, and durability, which makes these coatings a favorable choice for applications where the surface is prone to corrosion due to adverse environmental conditions. In terms of the application, the wind power coatings market can be classified on the basis of onshore and offshore. The onshore segment dominated the global wind power coatings market due to increased demand of these coatings in onshore wind farms across the globe. While offshore segment is anticipated to grow at the significant rate in the near future due to decreasing cost of the offshore wind installation and decreasing land availability for onshore wind farms. Geographically, the wind power coatings market can be classified into North America, Europe, Asia Pacific, Middle East & Africa, and Latin America. 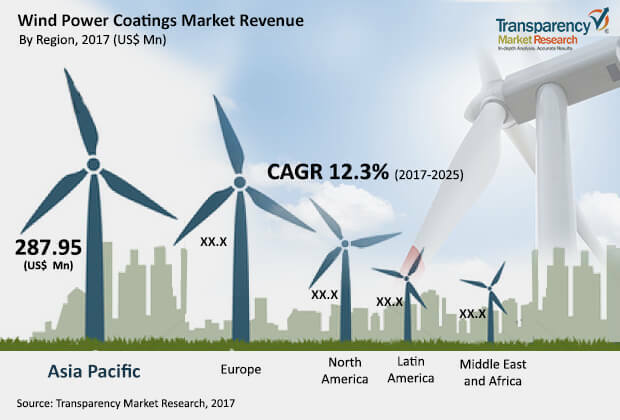 Asia pacific dominates the market for wind power coatings in terms of demand and revenue, followed by Europe and North America. Consumption of wind power coatings in India is growing at a significant pace owing to increased investments in the wind power sector and China is a leading consumer of wind power coatings owing to the large number of wind farms in the country. Middle East & Africa is anticipated to be the fastest growing market for wind power coatings, thanks to the easy availability of feed stock and increasing investment in the renewable industry in the region. Key players operating in the global wind power coatings market include Akzo Nobel N.V., Hempel Fonden, PPG Industries, Inc., Jotun Group, Teknos Group Oy, 3M Co., The Sherwin-Williams Company and others.